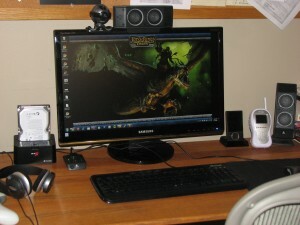 As a Christmas followup to my September PC upgrade, I bought a Samsung 24″ 1080p LCD monitor. I’d been watching the sale adds for a while waiting for the price to drop, and Best Buy made me an offer I couldn’t refuse about two weeks before Christmas. It has been really great having a full 1080p screen for PC games, but it has been even better to be able to move my Xbox 360 from the living room to my office. See my office is my space, but the living room is shared with my toddler son and my non-gamer wife, so I don’t get much living room to play. Unfortunately by the time everyone goes to sleep and I can use the Xbox, I’m deep in a PC game of some type, so my Xbox sits mostly gathering dust until there’s a new release out (like Batman) out that I’m obsessing over (like Batman). This has actually become part of my decision process for buying multi-platform games. It used to be I would buy Xbox over PC because my PC just couldn’t handle most of the more recent games. After upgrading this September, though that’s no longer an issue. After that, the decision was based on how much time I thought I would spend in the game and whether I thought I’d play it online with XBL friends. Usually I would steer to PC if I could since I had more flexability for playing times. I’m sure I could’ve hooked the Xbox up to my old 19″ Dell, but when I’m looking at a 51″ rear projection TV, 19″ is just too much shrinkage. The Samsung seems just right given the shorter distance from the screen, and it is 1080p so there’s been no issues with graphics or fonts. Ha…nice! I like the upgrades…and we have the same baby monitor. I need to photo my upgrade to my own man cave. It looks remarkable like this one. It is nice to be able to see if he’s just restless or standing up and shaking the bars of his crib. Saves me false alarms and let’s me warn any fellowship I might be in if it is a 1 minute /afk, a 10 minute one, or a sorry gotta go one (this last one hasn’t happened yet). I’m jealous of how clean your desk is 🙂 I have way too many wires as I have 2 machines and way to many external hard drives… Not to mention I do have a bit of an issue with paper clutter. I should have a new 18″ monitor coming soon (UPS has lost it) so I’m not sure if I’ll be playing LOTRO on that or continuing on my 17″ laptop screens. I usually have stacks of books, game boxes, magazines, notepads, and miscellaneous papers covering my desk. I appreciate the compliment, after all I did try to spiff up a bit before I took the photo. Might be fun to do a blog meme of sharing photos of our gaming spaces, if people are interested in that kind of thing. That’s awesome. I have been using my monitor for not only my PC, but for my Xbox and PS3 as well. Having an HDMI and DVI input makes it possible. I have one question: what is that thing on the left of the picture next to your monitor, a hard drive? My monitor doesn’t have HDMI (or speakers) so I’m running the PC on the VGA port and the XBOX is on an HDMI to DVI cable. I have the audio out on the Xbox running through the line-in on my soundcard, so the volume control on my desk adjusts everything. The box to the left of my monitor is an eSata hard drive dock that I bought through Amazon. I’m using it to do scheduled and ad hoc backups.